a) A Mars-like world with a thin atmosphere of less than 0.01 bar; the amount of Rayleigh scattering is minimal, but particulates suspended in the atmosphere colour the sky by Mie scattering and selective absorption. b) An Earth-like world with an atmosphere of one bar; the colour 'sky blue' predominates because of Rayleigh scattering, getting paler towards the horizon. c) A world with a pure, particulate free molecular atmosphere of 10 bars; the sky colour is cyan, with the horizon considerably paler. d) A world with a pure, particulate free molecular atmosphere of 40 bars; the sky colour is pale yellow, with the horizon almost white. Surprisingly, such a simple detail as the colour of the sky on an alien world is far less than obvious. There are three reasons for this: incomplete knowledge concerning the workings of the human eye and the perception of colour, a very broad range of possible alien atmospheres, and of course simple lack of experience. Though the fundamental physical principles are all well known, their application is less than obvious. Mars' pink skies were a surprise when they were first seen. The appearance of the sky depends very much on the equipment used. For instance, humans see radiation in the 380 to 760 nm range (bluish purple, to blue, to green, to yellow, to orange and red, and to reddish purple). However, even within this range we do not perceive colours equally. We actually have three sorts of receptors in the eye: one with a peak at red, one with a peak at blue, and a third with a peak at green. Other colours are known by interpolation. For instance, a computer screen never gives off yellow light, and it doesn't need to for a human, since the human brain assumes yellow from the balance of green and red light it perceives. Similarly, both edges of our range look "purple", which is what we read when light reaches us but isn't strongly affecting any of our colour receptors. What we call brown is actually a mental construct, based on a stimulus to our three kinds of colour receptors. Other vertebrates see colours over approximately the same range that humans do. Wavelengths shorter than 300 nm and longer than 800 nm cannot be detected with a photochemical eye based on organics, since shorter wavelengths destroy the material and longer wavelengths are not powerful enough to affect it. However this does not mean that other animals see the colours that humans do. Most mammals have only one or two sorts of colour receptors in the eye and presumably distinguish fewer colours. Many birds and fishes may have greater colour definition since they have four or more types of colour receptors. The bird's extra receptor is in the ultraviolet range, adding an entire range of colours of which humans are unaware. Many insects have three receptors, like humans, but one of the three picks up ultraviolet. What these organisms see when they look at the sky is a matter of speculation. Some insects perceive whether or not the light is polarized and in which direction, which means that different parts of the sky look different to them according to where the sun is. This allows them to tell direction if they know what time it is and can see even one patch of open sky. If we had this sense, the sky would look very different to us than it does now. In the Orion's Arm setting different clades would see very different things in the same sky and some of them would describe things that would sound extremely bizarre to an unsophisticated nearbaseline human. Earth's own turquoise blue sky, as seen by humans, comes primarily from the Rayleigh effect. If the atmosphere is otherwise transparent then particles the size of air molecules scatter short wavelengths best and longer wavelengths the least well. The difference in the scattering effect between any two wavelengths can be predicted directly from the ratio of their wavelengths. Blue light is scattered more than red light, so given one atmosphere of pressure the sky looks blue. If the human eye were equally sensitive to all wavelengths the sky might look violet or ultra-violet, since those wavelengths are the most strongly scattered. However because our sun's light is somewhat stronger in the blue-green than in violet, and because our visual apparatus is more sensitive to blue and green than to violet in any case, the sky actually has a turquoise colour as we see it. In the visible range nearly all common and probable atmospheric gases are transparent. The exception is methane. Methane absorbs red light, and therefore to the human eye an atmosphere with even a few percent methane appears blue-green under standard sol type illumination. This accounts for the appearance of Uranus and Neptune in today's solar system, and indicates that the sky of the early earth might have had a greenish tinge. Under sunlight methane forms a reddish smog-like haze, so if the proportion of methane is quite large (as on the moon Titan) the sky becomes hazy and reddish instead. This would probably not happen in an oxygen-nitrogen atmosphere breathable to humans since methane would not likely exceed a few percent. In the presence of oxygen methane oxidizes into carbon dioxide and water. Another effect is the total amount of atmosphere. If there is no air at all then the sky will be black, as it is on the moon, since no light is scattered. It acquires more and more of whichever colours it would otherwise have as it thickens. This can be seen at high altitudes on Earth; the sky becomes a darker and darker blue until it becomes entirely black. What happens as the atmosphere thickens is something one can see at sunrise and sunset. If the sunlight goes through enough air then the blue and green light are so scattered that you start to see the reds and yellows, and the sky has a golden or yellow hue, pink, and then red. Green isn't normally seen as a sky colour on earth unless clouds block just the right portions of the rest of the sky, but it does occur sometimes during storms when the sun is low in the sky. A distant patch of sky on the horizon will look green under those conditions. Theoretical studies of sky colours by C.F. Bohren, and by Bohren and A.B. Fraser (see references below) have set out the effects of increasing atmospheric pressure on sky colour and on the purity of that colour. Please note that the following graphs apply only to a clear, dust-free molecular atmosphere such as a nitrogen, oxygen or hydrogen atmosphere; particulates, haze, mist or cloud or coloured atmospheric gases would change the colours observed considerably. Figure 1: In an Earth-like one bar atmosphere the colour of the sky is most pure at the zenith, but decreases in purity towards the horizon (from Bohren and Fraser 1985). Figure 2: With increasing pressure, the purity of the sky colour even at the zenith decreases, so appears closer to white; at 100 bars the colour is almost white (from Bohren and Fraser 1985). 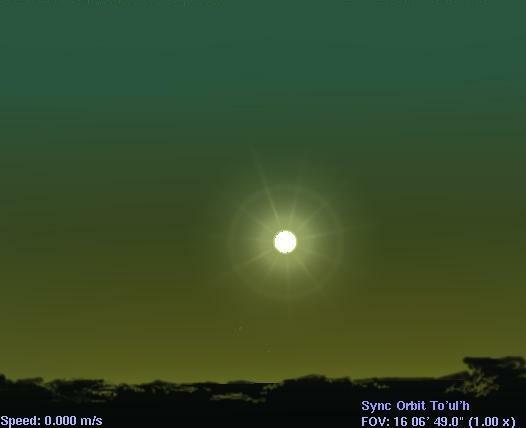 Figure 3: With increasing pressure the sky colour at the zenith becomes increasingly yellow. There is an increase in overall brightness but a decrease in purity (see also figure 2)(from Atmospheric Optics, C.F. Bohren). In very dense pure molecular atmospheres the peak of the sky colour spectrum would be in the red part of the spectrum, but the curve would be very flat and the purity would be low, so the colour would be pale. Pure dense molecular atmospheres are rare on terrestrial worlds though; most have some particulates, haze or cloud, which can be expected to redden the colours considerably. Terrestrial worlds might therefore have cyan, green, yellow, or reddish skies rather than blue skies, even if they are around stars like our own sun. Earth is on the inner edge of the habitable zone within the solar system. An earth-like planet could maintain liquid water on the surface for some considerable distance further out, but the net result would be an atmosphere much richer in carbon dioxide: one or several bars of pressure, in fact, resulting in whitish or reddened skies depending on what sorts of dust and haze are present. Unprotected or unmodified Terragen vertebrates such as humans would not have a chance to observe this effect directly out of doors though since such high partial pressures of carbon dioxide would be fatal to them. Dust or droplets in the atmosphere have a very different effect. If they are more or less transparent, like water droplets, or if they have no particular colour themselves, then they simply scatter all wavelengths of light equally. This is called Mies scattering, and it is the reason that a sky full of fine water droplets is a paler blue than a dry sky. At the extreme, of course, the sky is white or grey (i.e. cloud covered). If the dust or liquid is coloured, the sky will take on that colour. The pink sky of a planet like Mars, with a very thin atmosphere, is caused entirely by fine iron-rich dust particles suspended in the air; the atmosphere itself is too thin to contribute any significant blue colouration through Rayleigh scattering. The planet's surface gravity also has an effect. Air pressure falls off more slowly with height on a low gravity world, and you need more air "on top" of you at the surface to give an earth-like air pressure. So assuming earth-like atmospheric pressures, many light gravity worlds would have whitish or reddish skies. On the other hand, because they would still have higher densities at greater heights they would support more clouds and dust. This would make the skies whiter, so a white sky is not at all implausible. It is likely that if you were to provide the Moon or Mars with a hydrosphere and a clear breathable atmosphere (one bar at the surface) the sky would be pearly white. A Superterrestrial with high surface gravity might have an earth-like sky if it has a one-bar atmosphere, but most hi-gravity worlds retain denser atmospheres due to the increased escape velocity so the sky colour will likely be in the yellow to red range. Sky colour at zenith on an Earth-like world under various different types of star. Changing the illumination changes the sky colour yet again. Though a type G star like the sun has a peak in the green/blue range, a type M star has a peak in red, K peaks in orange, F stars are brightest in the blue, and A and higher are brightest in the ultraviolet range. For this reason the stellar class affects the colours of planetary skies significantly. An Earth-like planet circling an F-type star will have skies of a vivid blue, with scattered blue light making up 77% of the total perceived colour; planets orbiting G-type stars have 'powder blue' skies, with blue light making up 70% of the total. A typical K-type star will give a light blue colour with a 61% blue component to the sky of an orbiting Earth-like planet, while the most common type of M-type red dwarf will impart a pale-whitish blue colour to the skies of such a world, with no more than 44% blue in the mix. Of course the effects of atmospheric density and the effects of spectral class must be taken together. For instance a planet with a colourless, dense atmosphere orbiting a red dwarf will have a sky which is almost completely white; clouds on such a world would reflect the unscattered light from the star and appear yellowish or reddish. Any coloured gases or particulates will affect the colour still further. On a world that has life forms, the sky colour might be affected if enough of those life forms are airborne. If for instance the photosynthesizing organisms used chlorophyll this is one of the relatively rare circumstances that would result in a green sky. The sky on To'ul'h appears green partly because of its high density, but mostly because of green particulates, airborne phytoplankton using chlorophyll and xanthophylls. Sky plankton may occur on several different classes of world, including gas giants, terrestrials and superterrestrials. 5.4.2 Sky Colors: Robert A. Freitas Jr. The Sky on Alien Worlds by Stephen Inniss and Steve Bowers; first uploaded 1 September 2004, last amended 20 June 2012.